Carol Mendel's visitor maps are full-color, pictorial maps of major visitor destinations. The large type makes them easy to read, and the many illustrations make them fun to use. They are useful both to get you where you're going, and to keep as a souvenir of your visit. 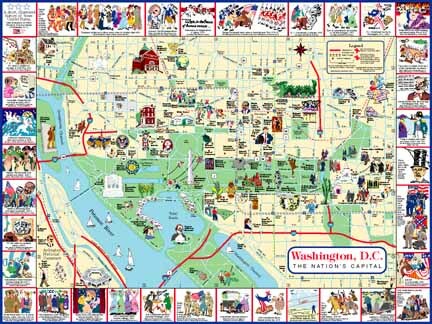 This pictorial map of the central Washington DC area covers one entire side of the printed visitor map. The map is surrounded by a border illustrating important events in U.S. history. The other side of the map includes indexes, information about major attractions, and this map of the metro area.